Exciting news – our 2019 AFTA promotion has been launched – it uses the front cover of our new 2019 AFTA map. Our maps are currently being distributed to members, stations and tourism points across the area. Make sure you pick up one of our new maps and start collecting stamps to win great prizes! On the front of each of the new AFTA maps are 3 positions to collect stamps. Pick up a map and collect a stamp each time you visit and make a purchase at AFTA sites. Hopefully you will explore the Forest and visit 3 different sites. However it still counts if you visit one site on 3 different occasions and make a purchase each time. 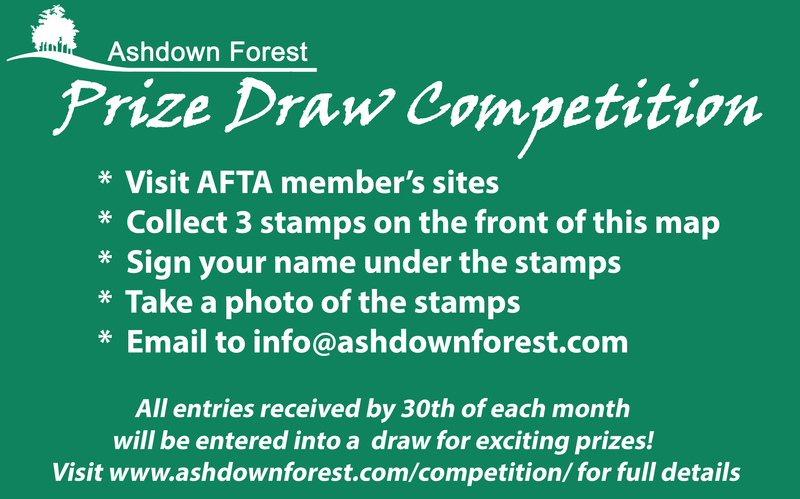 Once you have collected 3 stamps, sign the map on the line shown, take a photo of the stamps and send it to me by email at info@ashdownforest.com. All photo entries received by 30th of each month will go into a prize draw to win exciting prizes. What prizes could you win? Perryhill Orchards is a lovely Farm Shop with a popular tea room with outside seating and lovely views across the valley. There is also a butchers and a fireplace centre on site. Further prizes will be announced very soon.